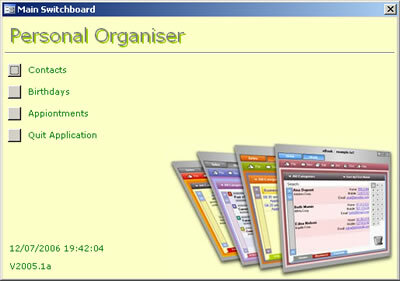 Splash Screen: The Personal Organiser splash screen displays when we open up the database. After 4 seconds the splash screen closes and displays the main switchboard shown below. Database Switchboard: The main switchboard contains commands to access three further switchboards. We can also Quit the application from this screen. Alternative Switchboards: Here we see all of the different options available on each of the different switchboards. Each switchboard has options to open various forms and reports that are available. Each switchboard has an option to return to the main menu. 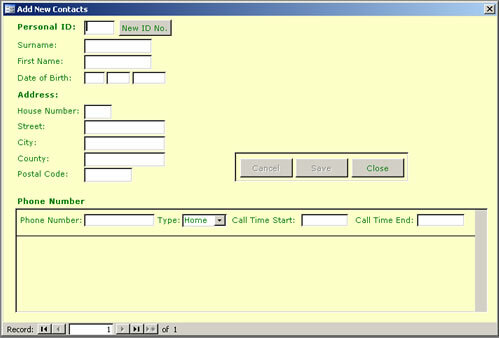 Data Entry Screen: The Add New Contacts screen allows us to add the Contact personal information. We can also assign multiple contact phone numbers in this screen. 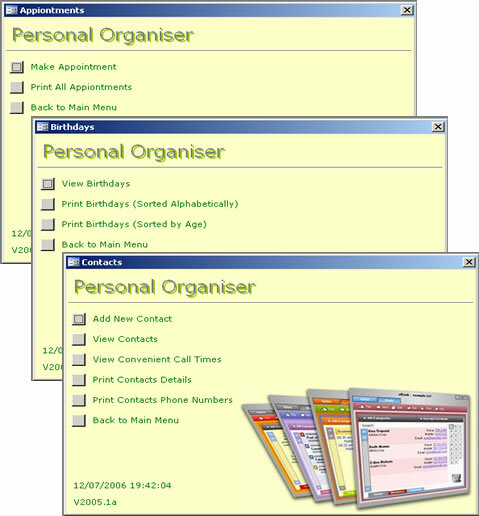 View and Search Forms: From the Contacts switchboard, we can choose to view the data in various ways. Here we can search and view Contact data and also view Contact Phone information. Generating Reports: From the Birthdays switchboard, we can generate various reports. These display and group information in a variety of ways. Scheduling Appointments: From the Appointments screen, we can schedule appointments to be made. 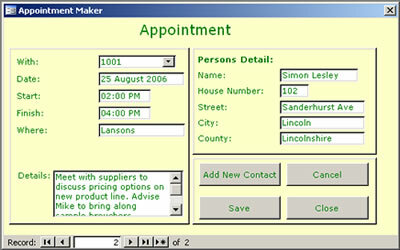 From the Appointments switchboard, we can generate a report of appointments in the future. These display all relevant information relating to each appointment.